Phew! What a week it has been... My grandma celebrated her 80th birthday, we saw hubby's parents and the pair of us had a dodgy tummy bug at the start of the week. What did I find tough? I had a rough day on Wednesday and I wanted to eat sooo much. Anything naughty would have done! Cake...chocolates...Chinese...biscuits...Indian...pizza...crisps! You name it! I really struggle with emotional eating, it's part of my problem. So I was glad that I was able to stay strong and resist. I also felt a bit like I was denying myself, a couple of times this week...but then I remembered that NOT denying myself is what got me here in the first place. I had a great time celebrating my gran's 80th birthday and enjoyed a lovely slice of cake. Luke has been supportive and has begun adapting his own evening meals to complement mine, which is good (and better for him). I tried a new breakfast, which was granola, 100g low fat Greek yoghurt and a tablespoon of organic honey. I also tried a new lunch which was lemon and bulgar wheat cous cous with chopped orange mixed in. Both we're nice and I'll be eating the granola a lot more, I think! You really can lose weight just by monitoring your calorie intake and trying to move more. 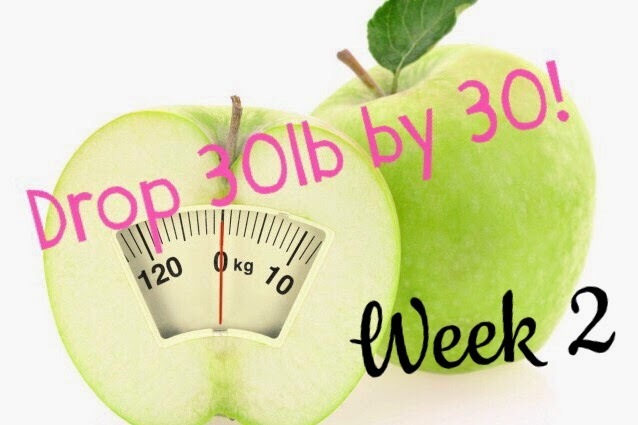 I'm pleased with my half a stone loss in two weeks and it's a great kick start because I know I won't lose such big amounts now (always lose the most in your first week or so). Tonight we're going to have a treat, but other than that I am sticking to it! How has your week gone? Are you trying to lose weight too?